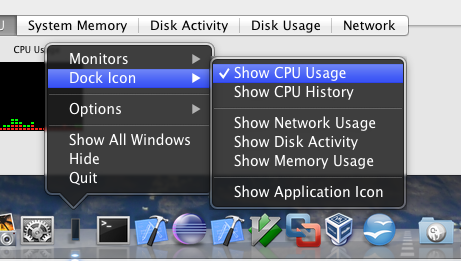 On Macs with more than four cores, a single graph showing aggregate usage of all the CPU cores is shown in the main Activity Monitor window, in the CPU History window, and on the Dock icon when configured to show CPU Usage or CPU History. To see the CPU usage for each core individually on systems with more than four cores, use the CPU Usage window or Floating CPU Window. These windows can be viewed by selecting them from Activity Monitor's Window menu. Note: The CPU Usage window cannot be displayed if CPU Usage is being shown on the Dock. To stop showing CPU Usage on the Dock, choose View > Dock Icon, then select any choice besides "CPU Usage", such as "Application Icon". Is there any way around this? With aggregated CPU view it could be harder to detect when a process is hanging or hogging a CPU thread. There is a bug in Activity Monitor v10.8.0 (806). If you select Dock Icon > Show CPU History, is automatically closes the floating window and appears in the dock. If you attempt to switch back to the floating window, sometimes only one core appears. This bug is not always reproducible, but I've experienced it before. It's a really funny and stupid bug. Dock Icon -> Show Application Icon. Dock icon right click -> Force close (or close). 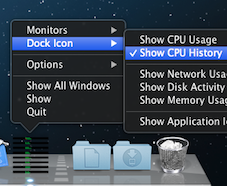 Dock icon -> Show CPU History. [The float windows with 8 bars should close, and the dock icon should show 8 tiny bars. !. This does not work for "CPU Usage", it's always one stupid vertical bar. !. You need to do this EVERY TIME you close the activity monitor process. Not the answer you're looking for? Browse other questions tagged macos hardware activity-monitor processor .